Fran (Fannie) Tallman Mitchell passed away peacefully on December 26, 2018. She was born July 27, 1930 in Texarkana, Texas, the first child of Harold Manly and Evie Mae (Cooper) Tallman. She was raised on a ranch in Upton, Wyoming. Her parents later bought two of the filling stations and the only diner in Ucross, Wyoming, where people driving west to Yellowstone stopped for gas and then had to choose which highway to take before the interstate existed. It was at the diner in Ucross where she met the love of her life, Roy Mitchell, of Clearmont, Wyoming. They married on August 19, 1950. Their union was blessed with four children, as they moved for his work between Wyoming, Kansas, Minnesota, finally settling in the front range of Colorado. In addition to raising her children, she worked in a variety of occupations throughout their marriage, including Office Manager for Duran Superior Coffee, Union Steward when working for Albertsons, Real Estate Agent for Coldwell Banker, retail jobs, helped her parents in their business, and served the public in various ways. She always downplayed her role as one of the breadwinners in the family, saying her work just bought the butter while Roy’s income took care of everything else. 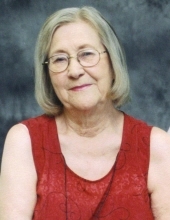 Fran and Roy retired to Conroe, Texas in 1989, and there Fran devoted her retirement to reading, cooking (she was a marvelous cook), embroidery and other needlework. She was fierce protector of her family and always put them before herself. She made life-long friendships wherever she lived, she was an avid Facebook user and stayed interested in not only her immediate family but also her extended family and friends. In Texas she loved the bluebonnets and the beach in Galveston. She was always grateful and happy she and Roy made the move to Conroe, but she never did get used to Tex-Mex and always missed Colorado green chile. Fran was the mother of four, grandmother of ten, great-grandmother of eight, and great-great grandmother of one. She was preceded in death by her parents and her niece, Natalie Tallman. Fran is survived by her husband of 68 years, her children and their families: Robert Mitchell; Nancy (Mitchell) Edwards, her husband Denny, their sons; Anthony Heim, Lyle Heim, Jay Edwards, Patrick Edwards, and their families; daughter Mary (Mitchell) Wilmetti, her husband Joe, and their children Erika Wilmetti and Ray Wilmetti; son Tom Mitchell, his wife Jere Zimmerman, their children Keli Mitchell, William Mitchell, Arthur Zimmerman and Robert Zimmerman; and her brother Harold Lee Tallman, his son David Tallman and family. A memorial service is planned for summer 0f 2019, near Upton, Wyoming where Fran’s ashes will be interred in the family plot. To send flowers or a remembrance gift to the family of Fran Tallman Mitchell, please visit our Tribute Store. "Email Address" would like to share the life celebration of Fran Tallman Mitchell. Click on the "link" to go to share a favorite memory or leave a condolence message for the family.